John Allen Jones, 24, of 1203 Piney Creek School Road, Piney Creek, NC, passed away on Wednesday, July 18, 2018 at his residence. He was born January 29, 1994 in Forsyth County, NC to Johnny Ray Jones and Melissa Combs Crouse. He was preceded in death by his maternal grandfather, Ed Combs. John Allen is survived by his father, Johnny R. Jones (Jennifer) of Piney Creek; mother, Melissa Couse (Sonny) of Glade Valley; brother, Aaron Jones (Mary) of Glade Valley; maternal grandparents, Velva and Jerry Hodge of Piney Creek; paternal grandparents, Mary and Richard Jones of Piney Creek; great-grandparents: Blanche Edwards of Sparta, Louise Jones of Piney Creek; special brother, Jacob Cochran of Sparta; several aunts, uncles, cousins and a niece also survive. Funeral Services will be held to honor the life of John Allen at 3:00 pm on Sunday, July 22, 2018 at Cornerstone Christian Fellowship in Sparta with Brother Ed Hall, Reverend Mark Jones, and Reverend David Lyall officiating. Interment will follow at South Fork Cemetery in Piney Creek. The family will receive friends Sunday, 1:30 pm until time for the service at the Church. 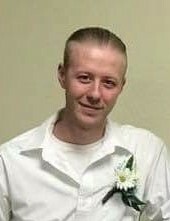 In Lieu of flowers, the family request that memorials be made to Eric Thomas Funeral Service Licensee, LLC, PO Box 114 Sparta, NC 28675 to assist with funeral expenses. Eric Thomas Funeral Service Licensee, LLC is honored to be serving the Jones family and if you wish, online condolences may be extended to the family at ericthomasfsl.com.